There is a crisis of public confidence in our press. It’s time for an open and honest debate about the role of the UK media in fuelling hate crime – and about the financial incentives which have corroded the quality of British journalism. The Government could help address these problems by aligning with the principles outlined in the new United Nations Global Compact for Migration. A more responsible approach to advertising could strengthen and enhance high quality journalism. Yet the evidence suggests a widespread crisis of public confidence in the ability of large parts of the UK press to deliver high quality journalism. A recent YouGov poll found that just 10% of British people believe the Daily Mail has a positive influence on our society. For the Sun – still the UK’s highest-selling newspaper, the figure was even lower – just 5% – while 50% of those surveyed believed its influence to be negative. This is despite the fact that the UK Government has given these newspapers millions of pounds of public money in recent years, channelled as advertising revenue. Overall, the UK press has consistently been found to be the least trusted out of 28 European countries – indicating exceptionally low levels of public confidence. Hate crime is at record highs, and experts have warned that this rise has been “fuelled and legitimised by politicians and by the media”. As long ago as 2010, experts were already warning that hostile media coverage was fuelling a rise in anti-Muslim hate crime. A survey in 2012 found that 91% of people with disabilities saw a link between negative press portrayals and rising hate crime against disabled people. The same year, the Leveson Inquiry into UK press standards found that “there are enough examples of careless or reckless reporting to conclude that discriminatory, sensational or unbalanced reporting in relation to ethnic minorities, immigrants and/or asylum seekers is a feature of journalistic practice in parts of the press, rather than an aberration”. In 2015, the United Nations High Commissioner for Human Rights highlighted “decades of sustained and unrestrained anti-foreigner abuse, misinformation and distortion” within the UK press, warning that “History has shown us time and again the dangers of demonizing foreigners and minorities… it is extraordinary and deeply shameful to see these types of tactics being used in a variety of countries, simply because racism and xenophobia are so easy to arouse in order to win votes or sell newspapers”. In 2016 the Sun and Daily Mail were accused of “fuelling prejudice” in a report by the Council of Europe on hate speech and rising racist violence. This report highlighted discriminatory coverage towards Muslims and migrants, Travellers and the LGBTI community. The authors warned that: “fuelling prejudice against Muslims shows a reckless disregard, not only for the dignity of the great majority of Muslims in the United Kingdom, but also for their safety”. 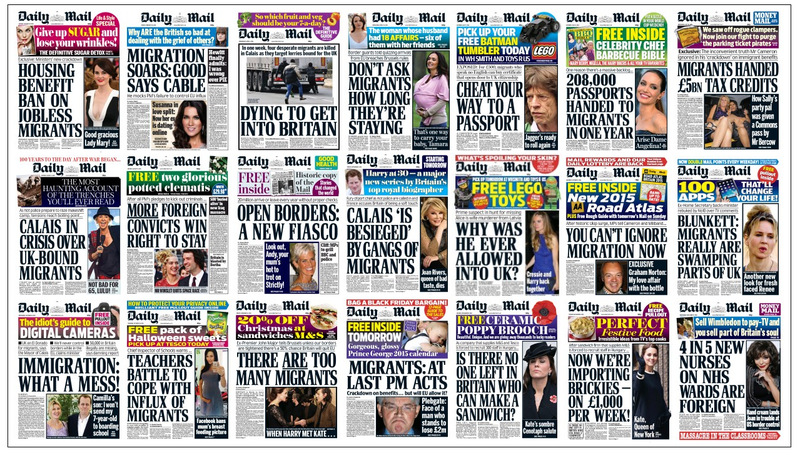 Also in 2016, the UN High Commission for Refugees found that the Daily Mail – along with the Sun – showed a hostility towards migrants that was “unique” among the newspapers they sampled across five European countries. In 2017, the Muslim Council of Britain’s Assistant Secretary General Miqdaad Versi revealed compelling evidence of a “consistent stream” of inaccurate stories about Muslims in the UK press. Meanwhile Baroness Sayeeda Warsi (former Minister for Faith and Communities) warned that elements of the UK press were “poisoning our public discourse” and “steadily and methodically using paper inches and columns to create, feed and ratchet up suspicions and hostilities”. Earlier this year, the leading LGBTI charity Stonewall highlighted a “spike in hateful media” and misinformation towards trans people: “Today’s hostile climate has been terribly damaging to trans and non-binary people who already face tremendous barriers and discrimination in everyday life. Two in five trans people (41 per cent) have had a hate crime committed against them in the last year, and one in eight trans employees (12 per cent) have been physically attacked at work”. The thirst for stories that vilify Muslims has eroded basic principles of journalism… Over the past decade or so, reporting on Muslims has gone from dog-whistling to fearmongering, to complete fabrication without consequences. To observe it doing so has been to watch a race to the bottom of standards violation. The impression I got… was that… editorial decisions are dictated more from the accounts and advertising departments than the newsroom floor… stories which sell well… had to be sourced on a daily basis… This naturally led to fabrication…. Much more insidious was when this same philosophy was applied to stories involving Muslims and immigrants… a top down pressure to unearth stories which fitted within a certain narrative (immigrants are taking over, Muslims are a threat to security) led to casual and systematic distortions. There is now widespread concern that the proliferation of free online content funded solely through advertising has further incentivised a proliferation of hate. Whether the stories are true or false, divisive and inflammatory content drives “clicks” – and therefore boosts advertising. This is not limited to the UK. The rise in ad-funded racism, xenophobia and other forms of identity-based hatred – linked to a wider upsurge in misinformation – appears to be a global phenomenon. All of us in this room play a role: the marketers pressing for billions of additional impressions at unsustainably low prices; the agencies pressuring the publishers for more and more free “added values”; the publishers so desperate for revenue that they run ads disguised as news and source “audience extensions” on unsavory sites; the tech companies whose algorithms drive consumers to deceitful content; the journalists who complain but remain in their silos, unwilling to understand, let alone participate in correcting, their industry. Unilever will not invest in platforms or environments that do not protect our children or which create division in society, and promote anger or hate. We will prioritise investing only in responsible platforms that are committed to creating a positive impact in society. In 2017 over £22 billion was spent on advertising in the UK alone. Globally that figure was around £425 billion. If enough advertisers follow Unilever’s example, this could have a transformative effect, diverting billions of pounds away from outlets that fuel hatred, and towards those which produce high quality journalism. The new UN Global Compact for Migration – which is due to be adopted in December – highlights the need for governments to acknowledge and address the worldwide rise in xenophobia, and “promote evidence-based public discourse” on migration. The agreement outlines a range of measures for doing this, including, “investing in ethical reporting standards and advertising, and stopping allocation of public funding or material support to media outlets that systematically promote intolerance, xenophobia, racism and other forms of discrimination towards migrants, in full respect for the freedom of the media”. This is an important recognition – backed by over 190 United Nations member states – that a more responsible approach to advertising could strengthen and enhance high quality journalism, while also being fully consistent with media freedom. Many of the challenges facing journalism – and corroding our public discourse – are global in nature. The Global Compact for Migration creates an opportunity for 190 governments to work together to address these problems, and take an international approach to tackling hatred and supporting high quality journalism. The United Nations human rights framework provides a clear and credible foundation for doing this. The UN-backed Camden Principles on Freedom of Expression and Equality offer guidelines for bringing about a media free from discrimination, which enhances high quality journalism and enables free debate. If implemented, these principles could play a significant role in improving the overall quality of British journalism and restoring public trust. i. Taking care to report in context and in a factual and sensitive manner, while ensuring that acts of discrimination are brought to the attention of the public. being furthered by the media. iii. Avoiding unnecessary references to race, religion, gender and other group characteristics that may promote intolerance. iv. Raising awareness of the harm caused by discrimination and negative stereotyping. they face. This should include the airing of programmes which portray different communities as equal members of society. 9.3. Professional codes of conduct for the media and journalists should reflect equality principles and effective steps should be taken to promulgate and implement such codes. 9.4. Professional development programmes for media professionals should raise awareness about the role the media can play in promoting equality and the need to avoid negative stereotypes. Elements of the British press have a long history of victimising minority groups within our society as a means of boosting sales – and more recently online “clicks”. Amid widespread public concern over this victimisation – and very low public trust – it is vital that organisations representing affected communities are at the heart of the debate on how best to address systematic institutional discrimination within the media, and improve the quality of UK journalism. If affected groups are seen to be belittled, dismissed or ignored in this discussion – either by the Government or the media – this could worsen an already polarised situation. In the meantime, the UK Government has an opportunity to take concrete steps to address this issue by publicly aligning with the principles outlined in the new UN Global Compact for Migration, and ensuring that its advertising procurement policies reflect these principles. This could help incentivise a more responsible UK media, which produces better quality journalism, benefitting the whole of our society.